Sounds like an interesting film. I hadn’t heard about it before. I like the director. Loved Tsotsi, really liked Rendition. Thanks for spotlighting this one. Enjoy TIFF. another one for the list ‘to see’, cheers Matt. Jay and I really enjoyed Eye in the Sky. The audience at the premiere was very engaged, and how could they not be? This is a tense movie throughout. It poses an impossible question: how do you weigh the value of lives? There were definitely laughs at the bureaucracy, though to me the portrayal was more real than farce – no one wanted to make that tough call. And I totally get why. It was a very human movie about war and that was what I liked most about it. It really is a great movie! Yeah, the humour definitely comes from the reality and frustration of the situation, not out of some pressure on the director or writer to include “funny parts”. At our screening, Gavin Hood advised us not to judge the beaurocrats too harshly until we questions what we ourselves would do sitting at that table. P.S. We didn’t get to see Alan Rickman or Aaron Paul but Helen Mirren made an appearance! I’m kicking myself for having missed that! 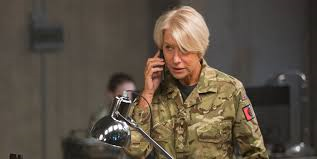 I’m really liking the sound of this movie and I do love Helen Mirren.